It’s a big part of my job to know the best products, new brands, and general shopping landscape. Fortunately, I find this “work” rather fun and exciting, so I often find myself doing “research” late into the night, discovering labels on Instagram, tracking items to see what’s still in stock, and seeing which retailers are buying into which trends. As someone who shops all day, I do end up buying more clothing than your average retail browser, and—full disclosure—receive some gifts. Like most people, though, when I choose to wear an item, it means that I’m endorsing the style, fit, and quality. Before anything made it into this story, it passed three gates: I find it special enough to add to my overstuffed closet, wear it on repeat, and snap a pic for my Instagram. Read on to see the items that passed this three-pronged test, from the Zara heels I walked 10 miles in to the $30 sweater I deemed lovely enough to wear to an important conference. 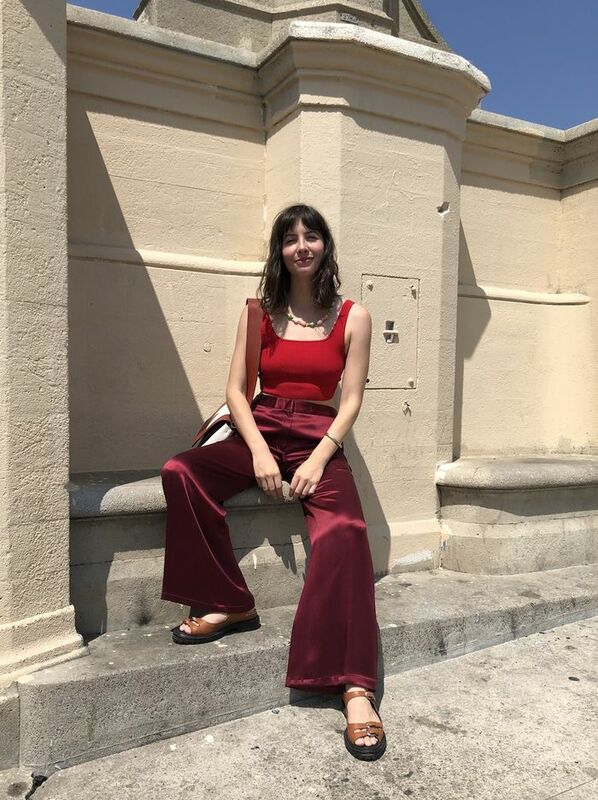 These pants are old Jenni Kayne, so they’re not shoppable anymore, but grab one of these Babaton tanks while they’re still in stock! I own one in blue, too, that I wore to New York Fashion Week. I stalked this dress from the moment I saw it in an editorial back in March. Imagine my delight when I discovered it majorly discounted on The Outnet. Bonus: This sweater comes in a pretty blue or pink too. I like to wear it backward (as pictured) so the buttons are in the front. This turtleneck is superior to others in terms of its material and color. Just trust me on this one. I wear Hayward bags like it’s my job and took a break from my beloved leopard one to introduce this pretty embroidered version into the mix. I like how the chain toughens up the sweet flowers. This sweater is so special and on the money trend-wise that I knew I had to wear it to fashion week. Also, those pink Zara shoes saw me through 10 miles of tromping around New York (and come in gold, if you prefer that). Fashion items that are a little off or unusual in some way always grab my attention. I don’t think I’ve ever seen a more aggressively square toe, which is why I love these funky shoes. I have no clue how there are still sizes left given that the price is slashed. This top looks super expensive. When I went to a Chanel event, the PR team said it’s the perfect Chanel-girl top, so there’s that! Next up, check out what our editors bought because of each other.